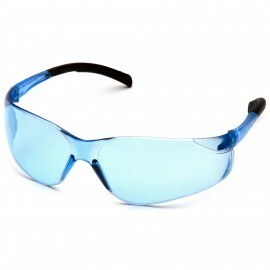 Remington brand safety glasses are the most comfortable glasses available. With their soft and full adjustable rubber nose piece and bayonet style temples with rubber tips, these glasses are comfortable enough for all day wear on or off the job-site. Remington T-72 Safety Glasses are popular among hunters and shooting enthusiast as reliable eye protection with ANSI Z87.1+1 impact standards. These glasses feature a wrap-around design with a one-piece lens that offers some side impact protection and does not obstruct your vision. The T-72 glasses are also designed for use in the following industries; construction, manufacturing, welding, carpentry, engineering, mining, agriculture and many more. For those looking for recreational eye protection during hiking, water rafting, skiing, biking, mounting climbing and skating, T-72 safety glasses are perfect for you. And don’t worry too, these glasses block from 99.9% of harmful UVA/UVB rays and are available in various lens colors to meet your specific needs.